Where is the limit of human endurance in sport? Handball players pushing this line further season by season, so there are a lot of TOP handball players in TOP clubs who are close to 40’s and even in 40’s. 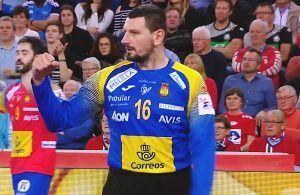 Handball-Planet.com presents a list of TOP 30 “handball old timers” (players born 1981 and older), players who are still in the best teams, leagues and form. The oldest one is Jose Javier Hombrados, legendary 46-years old goalie and president of Spanish Guadalajara, former BM Ciudad Real and Spanish NT member. Arpad Sterbik to join Spanish team in Cologne!